Falls and fractures are a leading cause of hospitalisation in seniors, with one-third of people over 65, and one-in-two people over 80 experiencing a major fall each year. For older Australians, the social and personal impact of a fall can be enormous; especially when the fall results in mobility-related disability and a sudden loss of independence. 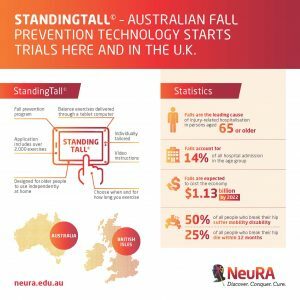 Neuroscience Research Australia (NeuRA), under the leadership of Associate Professor Kim Delbaere, has developed an innovative, world-first, technology-based program called StandingTall© to address the needs of correcting falls and balance in seniors. As a recent recipient of an Australian Government National Health and Medical Research Council grant (NHMRC) and now with national NSW and VIC partnerships and an international UK partnership with the Northern Health Science Alliance (NHSA), StandingTall© is set to start trials both here in Australia and in the UK. StandingTall© is an individually-tailored, home-based, fall prevention program based around a specific set of balance exercises delivered through a tablet computer. Being an App accessed via the internet makes the cost of delivery highly economical and then easily deliverable across multiple cultures and languages worldwide. The application includes over 2000 exercises with video instructions and is designed for older people to use independently at home. It allows participants to choose when and for how long they exercise throughout the week, with a recommended dose of two hours of exercise each week. The exercises are designed to train both static and dynamic balance skills, while standing on the floor or a foam cushion and while stepping in different directions and on a box. This research aligns with local, state, national and international goals to reduce falls in older people of our eight project partners in both Australian and UK national health settings. In Australia, the project has three New South Wales (NSW) policy partners who will provide strategic advice to implement the StandingTall© program across the state. These policy partners are the NSW Office of Preventive Health, Clinical Excellence Commission and Agency of Clinical Innovation. 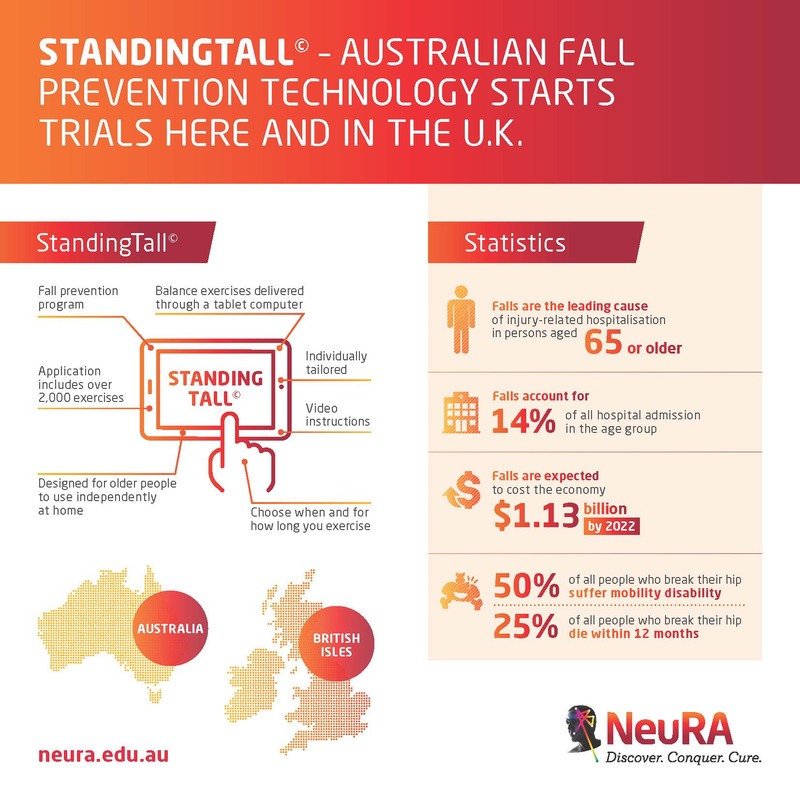 In addition, a total of three Australian-based clinical partners will support the practical implementation process of StandingTall© into practice. These clinical partners are two partnering NSW Local Health Districts (Mid-North Coast, Northern NSW), Uniting Care and Austin Health in Melbourne, Victoria. 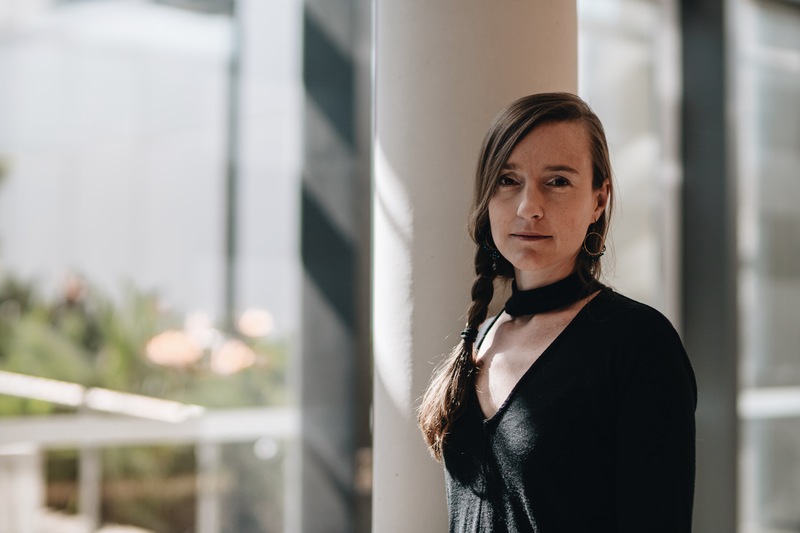 “This international alliance understands the immense need to curb the rate of falls in seniors, which often leads to hip fractures and loss of independence resulting in greater costs for carers, communities, their families and loved ones” said Associate Professor Delbaere. Utilising an easy-to-deliver mobile technology platform, StandingTall© has been designed to enable maintenance, updates, tailoring and exercise progressions to be updated online, whilst levels and challenges keep the participant engaged and challenged at their own rate. For those living in rural areas, StandingTall© is a game changer as it can be delivered to a simple in-home mobile device which can assist in the prevention of falls and hence prevent the need for emergency medical care from a debilitating fall. The recent success of the NHMRC grant and the national NSW and VIC partnerships and international partnership with Northern Health Science Alliance will see Associate Professor Kim Delbaere complete the final production elements of this innovative application that brings science and clinical practice together, to benefit the lives of our ageing population to help them age well. “We believe this innovative program offers huge potential in helping older people across the North which is why we’re delighted to be supporting its roll-out in the region,” added Doctor Yadi.